I’m going to apologise right from the top for the food obsession that’s likely to come across in this blog. What can I say my life mostly revolves around training and meals and eating out makes those meals far more varied! 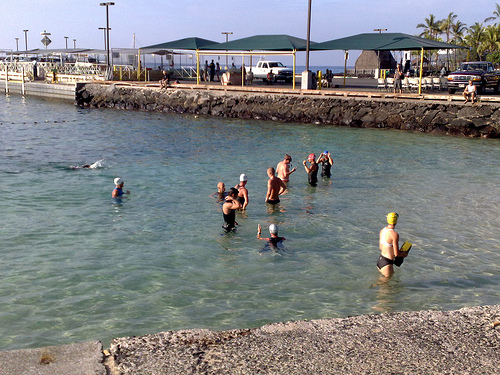 I landed in Kona on Sunday evening too late to do much more than catch up with Steven and Jo, arrange plans for day one and get to bed. It’d been a long day of travel and other than almost dozing off during Wall.E I’d not slept in thirty hours. That lends itself to a really solid night’s sleep though so I had no trouble getting to bed. Of course I woke nice and early and thought ‘Cool I can watch the sunrise from my balcony’. Seems like sunrise and sunset here is like an on/off switch, it’s a very sudden transition you blink and you miss it. Once the sun was out it did confirm my room had a sea view. At seven it was down to the pier for the first of our routine swims. Steven established this habit on his last trip here and I’m happy to go along with it. I’d been warned, but the water in shore is surprisingly cool. Fresh water springs send blasts of cold water into the sea making it a little less salty and a little colder than expected. Once you’re past them though the temperature is beautiful. We swam out to a buoy and back for what should be a 1.5 mile swim though with my sighting it was a lot more! Swim over and my first Kona meal! I was quite excited to be going to the famous Lava Java. It didn’t disappoint the coffee was pretty good (though we’ve found a better place) and the food was a Palaeolithic man’s dream in the form of a meat lover’s omelette. A nice big omelette absolutely loaded with a range of meats! After a relaxed breakfast, feeling absolutely stuffed I headed back to the hotel to get ready for a ride. Somehow I let myself be talked into four hours of riding rather than my original one! In retrospect I certainly don’t regret it, but at the time my legs just hurt! Steven is riding so strongly too that he was mostly a dot in the distance up the road. I started to gain more respect for the toughness of the course. Not so much the terrain, but the heat and wind is sapping as the day goes on. You have to get your fluids right for sure. At the turn around shop we gorged on tubs of macadamia nuts. Those things are packed with calories! I didn’t pay enough attention to the importance of nutrition either and ended up needing to nick one of Steven’s water bottle on the return journey. As rides go it was a real sufferfest for me. I just reminded myself of the issues of acclimatisation and fatigue. It’ll all come good. To finish the day off I went for a short and easy run up Ali’i Drive before dinner. I resisted any urges to run too fast even though that seems to be the done thing here! I even kept my top on despite the fact showing off your honed triathlete physique is also required! For dinner we were joined by Brit Pro Rachel Joyce a friend of Steven and Jo’s. We went to a local restaurant with sea views, though by the time we got there the sun had set so there wasn’t much of a view. I had my first experience of the Cobb Salad. No idea of its origin, but essentially it seems to be the largest salad involving the most ingredients you can get in these restaurants. Great when quantity matters. With day one of my taper involving 130km of cycling what makes sense for day two? 170km of course. Long before the journey out here Steven and I had planned a ride out to the turn around point at Hawi. 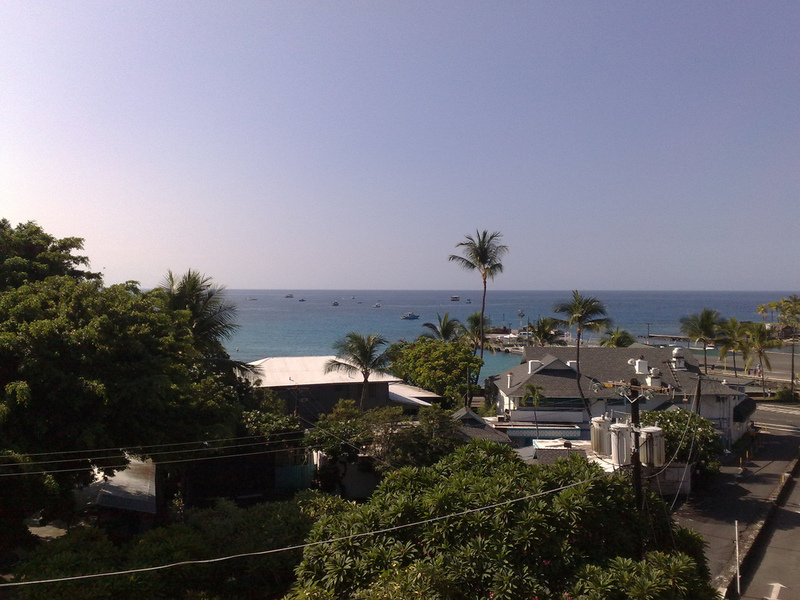 It was going to be a big day and we started it with another morning sea swim. It was busier down at the pier and there was some opportunity for some pro spotting too. 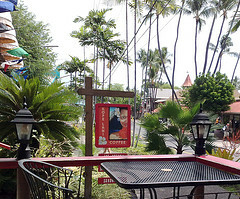 Breakfast was at Splashers this morning a quieter place than Lava Java and with a regular meat lover’s omelette too. Not quite in the same league as my first, but the coffee was free! Brekkie was also a little more rushed as we needed to get going on the bike. So we were back to the hotel relatively quickly and out onto the road. My legs didn’t feel quite so bad, though still far from strong. Fortunately the pace seemed a little easier than the day before. Once we made it to the shop we all consumed an enormous amount of fluids. Finally I’d found a legitimate need for those 40 Oz buckets of drinks you can get in the US! 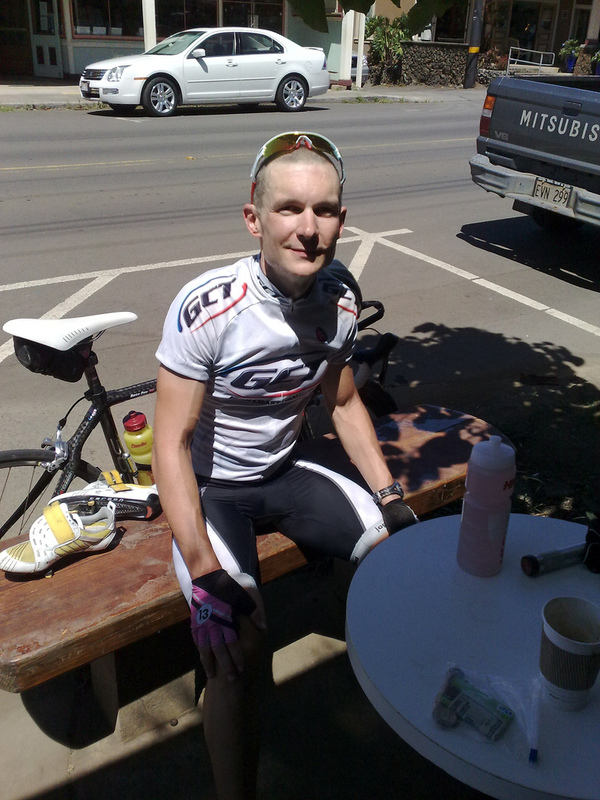 From here it was the grind up to Hawi with strong headwinds really making you work. I slogged up there with the thought of a coffee stop keeping me going. At the same time I dreaded that during the stop the winds would change direction! They didn’t quite turn on us, but by the time we got back to the Queen K they were in our face. On route there was a final stop at the shop for another of those vast buckets of soda and a eclectic mix of foods to get us home. Have to admit I’m not sure about Jo’s choice of a Corn Dog! Last stop done it was a frustrating journey back along the Queen K counting down the miles home. I try to keep my mind occupied converting the distances into kilometres! I decided to skip any thoughts of a run once I was back. I didn’t want to over do things and with my obsession with the numbers from WKO+ was in some danger of doing that. Besides it was late so the opportunity to clean up and get out and eat was too tempting. It was another Cobb Salad at a different restaurant this time. Much better than the first it has to be said. We stopped off at our new favourite coffee house Kopi Lani Coffee on the way back to the hotel establishing a routine of a number of rounds of strong cappuccinos each evening! I spent a lot of the time in the water today. Far more than I expected. The plan was to swim the whole course and thanks to the amount of chop and my ability to veer off course I ended up taking almost 90 minutes! I reckon I swam a good 500m extra though for sure! Plus we floated about a fair bit at a couple of marker points. Dolphins were clearly somewhere nearby in the water as I could hear their clicking calls, but never saw them. They probably had a lot less trouble swimming out there than I did! I’ll admit it was a little bit disappointing, but right now I’m not reading too much into it. There’s time to sort things out on the sighting front. 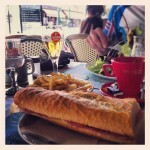 Breakfast was a disappointment today, especially after such a big effort in the water! Even the free flowing coffee was disappointing. The only food I had to look forward to was the remaining half a rotisserie chicken in my fridge! Before that I headed to the local gym for a light weights and stretching session. It’s an impressive setup there though far from cheap to use. I ended up chatting with a lady who organises the transition areas for the race. Very friendly and helpful with advice. I also signed up for a massage tomorrow and was impressed by the photos of the masseuses past clients. I’ll be in the company of many an Ironman champion! Here’s hoping it’s a good sign. After lunch I couldn’t resist some more of those cappuccinos so headed there with my new roommate for the week Martin Goodlad. I met Martin at Western Australia and spent many an afternoon having coffees with him there. This was familiar territory then! Steven joined us and we agreed a plan to go for a run. Following his injury problems Steven’s running is far from on track, but I figured it’d help reduce the training stress of the run for me. We ran out along Ali’i Drive to the turn around point. Whilst not interesting blog material a couple of urgent trips to the toilet on route seem to have cleared some on going stomach issues I’ve had and I’m starting to feel normal again! Hopefully it’s all out of my system and I can finally settle into proper training. Not sure what’s been wrong, whether it was from the travel or the climate, but it hadn’t made training comfortable. My original plan had been to run out to the energy lab, but as it is I’m glad I opted for Ali’i Drive and keeping things easier. As you know I’ve spent a lot of time analysing my training and planning my taper. To be honest it’s only today I think I finally sorted out exactly what I’ll do. Hopefully I’ve reduced things down enough now and I’ll properly freshen up. So far my rest has been a little off track and I’m not yet feeling race ready. Tomorrow is my first easy day. Morning swim and a nice, long brekkie at Lava Java. A short little run before I head off to my massage. Then probably chill out over coffees and maybe head to the pool as I hear you can swim for free and I might be able to sort out my ghostly tan!